Officials at the Guantanamo Bay prison complex in Cuba tried to trick Mauritanian detainee Mohamedou Ould Slahi into cooperating by forging a letter from his mother who couldn’t even write, his brother Yahdih, has said. Speaking at a jointly organized event marking the publication of Slahi’s memoir, “Guantanamo Diary,” Yahdih said that authorities at the prison forged the letter as a ploy to persuade him into cooperating with his interrogators, the Guardian reported. However, the trick failed because they misspelled Slahi’s name and he knew his mother couldn’t write. The event had been organized by the Guardian, the PEN writers’ association and Canongate, the publisher of "Guantanamo Diary." Yahdih said that his brother Mohamedou had been unable to see his mother once since he was detained in 2001. His mother died in 2013. Mohamedou Ould Slahi is the first inmate to have a memoir published while still incarcerated. 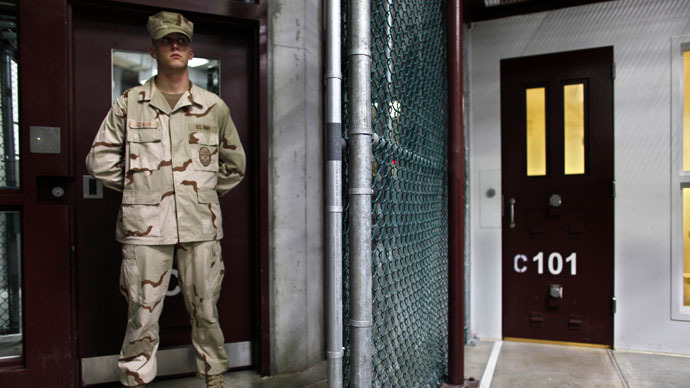 “Guantanamo Diary” was serialized in the Guardian and has been published in 20 countries. Mohamedou wrote his memoir by hand after learning English from his guards and interrogators, and it was finally published this week after a six-year battle by his lawyer, Nancy Hollander, to have it declassified. In it he describes how he was subjected to so-called “additional interrogation techniques,” which had been personally approved by then-Secretary of Defense Donald Rumsfeld, according to the book's editor. These techniques involved sleep deprivation, being subjected to strobe lights, being doused with water, threatened with dogs, being sexually assaulted by female interrogators and being forced to bark and perform tricks. “The convention against torture, of which the United States is a party, requires that countries prosecute those who have tortured – why hasn’t anyone been prosecuted? I’m talking about Secretary of State Rumsfeld - he’s the one who signed the orders to torture Mohamedou... he should be charged with conspiracy to commit torture,” Hollander told The Independent in an interview earlier this week. “I was living in terror. I don’t remember having slept one night quietly; for the next 70 days to come I wouldn’t know the sweetness of sleeping,” Mohamedou writes in his memoir. US authorities became suspicious of Mohamedou after he fought in Afghanistan in the early 1990s, but evidence linking him to Al-Qaeda and the 2001 World Trade Center attacks was deemed unreliable on account of it having been extracted through torture. He is now in a legal limbo of sorts, since even though a US district court ordered his release the US government subsequently lodged an appeal. The American Civil Liberties Union has launched an online petition calling for his release. The launch of his memoir will be like “holding up a mirror” to the American people, Larry Siems, a writer and former director of the Freedom to Write program at PEN American Center, told the event’s attendees. Despite having 2,500 blacked-out redactions by US authorities, the book hit Amazon’s top 100 just one day after being on sale.